Jesse Perez works in the Travel Safety Team at World Nomads and recently returned from adventures on the road. That's him on the left - safe looking guy hey? I went to Phnom Penh and Siem Reap in Cambodia, and Bangkok, Phuket and Ko Phangan in Thailand. 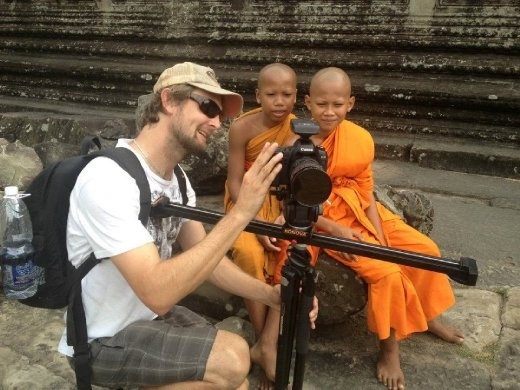 I was on assignment for the World Nomads Group to do a series of travel films covering a range of different topics including travel safety and giving back to communities in need through the Footprints network. What was your best cultural experience? Undoubtedly doing a film on a group of students from Mosman High who constructed 30 houses for an extremely poor village in Cambodia. These students raised over $50,000 (Footprints contributed $5000 to the project) - a phenomenal achievement. The level of emotion in this particular piece reached a fever pitch, especially at the end of the project during the presentation ceremony to the 150 or so villagers, who were blown away that people would come into their town and change their lives forever – it was an amazing experience, and something that I am tremendously proud to be involved with. On the other end of the scale, covering the Full Moon Party in Ko Phangan, Thailand was another highlight, albeit for different reasons. Many World Nomads go to this partying Mecca for a great time, but from a Travel Safety perspective it was incredibly eye opening to see bandaged bodies and wounded heads scattered around the island paradise – mostly from motorbike accidents of all things! Hopefully, the story will open peoples eyes to the dangers of the party – it’s a fantastic event and a lot of fun, but there are many things to look out for. 3 tips for other travellers? 1.) 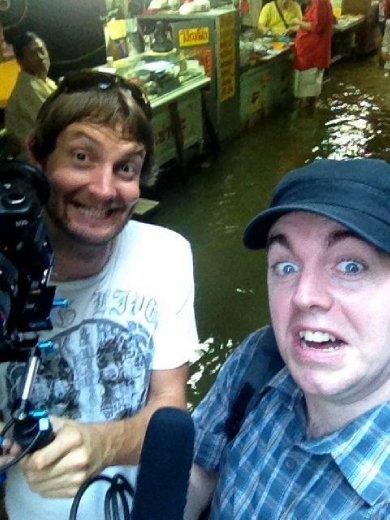 I was foolish enough to not take my own safety advice, and in the first day of Bangkok my camera man said to the TukTuk driver to “take us some place good” - lo and behold, we ended up at a dodgy restaurant that I covered in an article on scams in Thailand! Luckily we hotfooted the heck out of there or we would have been looking at $500USD for a bowl of rice and chicken. So my tip is to do a bit of research on the net before you go out in Bangkok – you don’t want to be eaten alive! 2.) If you are going to Thailand and don’t know how to ride a motorbike, don’t learn how to ride one there. I saw countless people bandaged up and many I spoke to were not only not licensed, many had never set foot on one in their lives. The lax policy from some motorbike hiring agencies does not mean that you automatically know how to handle yourself on two wheels – but this seems to be the attitude among many travellers. The other thing many bruised up bikers said to me is if they could have their time again, they wouldn’t get near a motorcycle – the incident ruined their once-in-a-lifetime party! 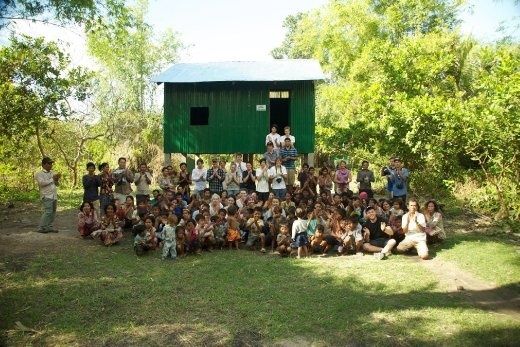 The house building ceremony in Cambodia. Probably the most powerful thing I have experienced in my whole life. Made me realise how much we have and how little some have. And funnily, those who have little seem to be a lot happier with what they have than those who have a lot. 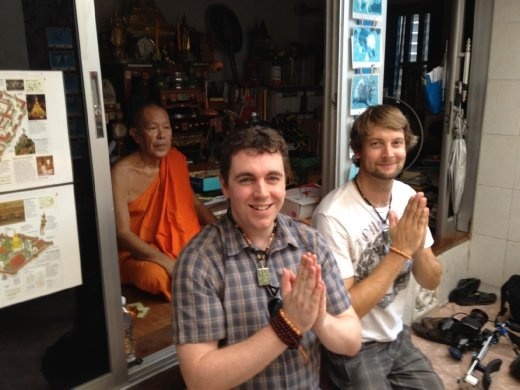 Getting a blessing from the Head Abbott at the Reclining Buddha Wat in Bangkok. We sought permission from the authorities to film there and he caught wind of this and asked us to come into his private little quarters to meet him. He gave us a buddha pendant for a safe journey (fitting), we made some bows and then he gave us a photo of his cat for some reason. It seemed to have worked, we came back completely unscathed. No Bangkok Belly, no injuries...all good. Walking into a combined school/temple in Phnom Penh to do some filming – the kids raced over to us and had surrounded us in the space of 20 seconds, and we captured it all...amazing and hilarious footage. The craziness of the Full Moon Party was certainly eye opening, and I have to admit, an absolute blast to cover. It gets a bad wrap in Australia – its actually a really fun event, albeit with some safety concerns to consider. The entire experience. It was grueling at some stages, and it was hard work to get everything done – but there are no complaints from me – it was utterly amazing, and one of the best experiences of my life. Looking forward to getting into the editing stage so I can share it all! And finally, what makes you a world nomad? I am fascinated by the stories of people from other countries and cultures – and capturing and helping tell those stories is a passion of mine. I truly believe that the more people you meet from all over the world, the more open you are to the world. WorldNomads.com is a global travel insurance company specifically focussed on independent and adventurous travelers. We also provide travel safety advice amongst a range of other services, such as language guides, free travel blogs, Answers – our community Q & A service and an international travel scholarships program. You can also donate to a community development project when you buy travel insurance through our Footprints charity program.